P. Karki, P. A. Yuya, Y. Kim, and J. A. Turner. (2016). “Nano-mechanical Properties of Constituent Phases in Bituminous Mixtures.” Journal of Materials in Civil Engineering, DOI: 10.1061/(ASCE)MT.1943-5533.0001605. H. Ban, S. Im, and Y. Kim. (2015). “Mixed-mode Fracture Characterization of Fine Aggregate Mixtures Using Semicircular Bend Fracture Test and Extended Finite Element Modeling.” Construction and Building Materials, 101(1), 721-729. S. Im, T. You, H. Ban, and Y. Kim. (2015). “Multiscale Testing-Analysis of Asphaltic Materials Considering Viscoelastic and Viscoplastic Deformation.” International Journal of Pavement Engineering, DOI: 10.1080/10298436.2015.1066002. Y. Kim, F. A. C. Freitas2, J. S. Jung, and Y. Sim. (2015). “Characterization of Bitumen Fracture Using Tensile Fracture Tests Incorporated with Viscoelastic Cohesive Zone Model.” Construction and Building Materials, 88, 1-9. Y. Kim, M. Haft-Javaherian, and L. S. Castro. (2014). “Two-dimensional Virtual Microstructure Generation of Particle-Reinforced Composites.” Journal of Computing in Civil Engineering, DOI: 10.1061/(ASCE)CP.1943-5487.0000448. J. E. S. Teixeira, Y. Kim, F. V. Souza, D. H. Allen, and D. N. Little. (2014). “Multiscale Model for Asphalt Mixtures Subjected to Cracking and Viscoelastic Deformation.” Transportation Research Record, 2447, 136-145. H. Ban, P. Karki, and Y. Kim. (2014). “Nanoindentation Test Integrated with Numerical Simulation to Characterize Mechanical Properties of Rock Materials.” Journal of Testing and Evaluation, 42(3), 787-796. S. Im, H. Ban, and Y. Kim. (2014). “Characterization of Mode-I and Mode-II Fracture Properties of Fine Aggregate Matrix Using a Semicircular Specimen Geometry.” Construction and Building Materials, 52, 413-421. H. Ban, Y. Kim, and S. Rhee. (2013). “Computational Microstructure Modeling to Estimate Progressive Moisture Damage Behavior of Asphaltic Paving Materials.” International Journal for Numerical and Analytical Methods in Geomechanics, 37, 2005-2020. Y. Kim, F. V. Souza, and T. Park. (2013). “Multiscale Modeling of Damage Evolution in Viscoelastic Bituminous Mixtures Subjected to Cyclic Loading.” Journal of Engineering Materials and Technology, 135(2), 021005. H. Ban, S. Im, and Y. Kim. (2013). “Nonlinear Viscoelastic Approach to Model Damage-Associated Performance Behavior of Asphaltic Mixture and Pavement Structure.” Canadian Journal of Civil Engineering, 40(4), 313-323. Y. Kim, F. V. Souza, and J. E. S. Teixeira. (2013). “A Two-Way Coupled Multiscale Model for Predicting Damage-Associated Performance of Asphaltic Roadways.” Computational Mechanics, 51, 187-201. Y. Kim and F. T. S. Aragão. (2013). “Microstructure Modeling of Rate-Dependent Fracture Behavior in Bituminous Paving Mixtures.” Finite Elements in Analysis and Design, 63, 23-32. F. T. S. Aragão and Y. Kim. (2012). “Mode I Fracture Characterization of Bituminous Paving Mixtures at Intermediate Service Temperatures.” Experimental Mechanics, 52(9), 1423-1434. H. Ban and Y. Kim. (2012). “Integrated Experimental-Numerical Approach to Model Progressive Moisture Damage Behavior of Bituminous Paving Mixtures.” Canadian Journal of Civil Engineering, 39, 323-333. H. Ban, Y. Kim, and I. Pinto. (2011). “Integrated Experimental-Numerical Approach to Estimate Material-Specific Moisture Damage Characteristics of Binder-Aggregate Interface.” Transportation Research Record, 2209, 9-17. 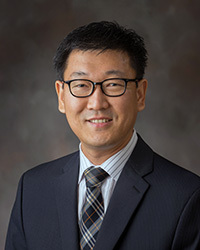 Y. Kim. (2011). “Cohesive Zone Model to Predict Fracture in Bituminous Materials and Asphaltic Pavements: State-of-the-Art Review.” International Journal of Pavement Engineering, 12(4), 343-356.